Limitations: This plugin does not enable authentication with multilateral Shibboleth. Use is restricted to non-federated, bilateral configuration with a single IdP only. This documentation is up to date as of version 1.0.0 of the Pressbooks SAML2 Single Sign-on plugin. 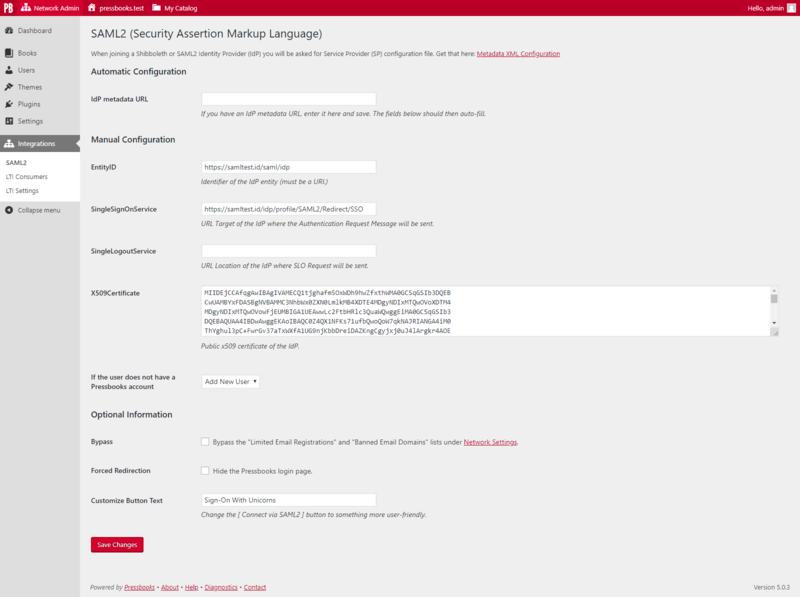 The SAML2 SSO plugin is installed and activated on the network level. Follow the steps in the README file. Be sure to correctly install, configure, and secure the security certificates. Note: If the Network Setting for “Allow New Registrations” is set to “No Registrations Allowed”, the SAML2 “Add New User” setting will bypass the Network Settings and register new users. For detailed behaviour on new user handling, see the section Details of settings behaviour: Add New user / Refuse access behaviour below. SingleLogoutService: URL Location of the IdP where SLO Request will be sent. Bypass: Bypass the “Limited Email Registrations” and “Banned Email Domains” lists under Network Settings. Forced redirection: Hide the Pressbooks login page and go directly to the insitutions’s SAML2 login page. Customize Button Text: Customize the label of the “Connect via SAML2” button in the Pressbooks login page. If Forced Redirection is checked, then this field is disabled. Out of the box, the plugin requires the Assertion elements of the Response to be both encrypted and signed. If the Bypass option is OFF: Pressbooks’ Network settings for both authorized and banned email domains will be applied and enforced. If the Bypass option is ON: The “Limited Email Registrations” and “Banned Email Domains” lists will not be applied or enforced in the case of SAML2 logins. For example, even if the email domain entered in SAML2 settings matches a Banned Email Domain, a user will still be created. If Forced Redirection is OFF, the “Sign In” link from the network website homepage brings the user to the Pressbooks login page, where a “Connect via SAML2” button will appear in the login form. Clicking on this button will bring the user to the institution’s SAML2 login page. If Forced Redirection is ON, the “Sign In” link will bring the user directly to the institution’s SAML2 login page. NOTE: Once the user has had this error, any subsequent clicks on “Connect via SAML2” directly in the login form will generate this error message again, as the user is already authenticated in SAML2. Every time they click “Connect via SAML2”, SAML2 recognizes them as authenticated, but Pressbooks is refusing access. To log out, the user must either go to the SAML2 logout page or close the browser, terminating the SAML2 session. The button can accept multiple lines of text. Add a <br /> tag in the button text to insert a line break. When a user logs into Pressbooks via SAML2, the SAML2 plugin will attempt to find an existing user corresponding to the user who is logging in. If it does not find the user, the SAML2 plugin will either create a new user (if the SAML2 setting is set to “Create new user”) or refuse access (if the SAML2 setting is set to “Refuse access”). Optional: eduPersonPrincipalName (urn:oid:1.3.6.1.4.1.5923.1.1.1.6, or equivalent) Upon the first launch for a given user, if mail cannot match an existing person, and this value is present, we’ll try to use it. This allows us to, if we wanted to, manually assign any uid to any user with an imaginary mass import script, a new doesn’t yet exist interface, etc. wp_usermeta.meta_key and wp_usermeta.meta_value are set by the SAML2 plugin upon first user matching; subsequent logins follow case #1 above. If neither #1 or #2 are found, create a new user. wp_usermeta.meta_key and wp_usermeta.meta_value are set by the SAML2 plugin upon user creation; subsequent logins follow case #1 above. Network admins who have manually created or plan to manually create new users in Pressbooks should take care to use the correct user email address for these manually created accounts so that the SAML2 plugin can properly match this manually-created user if/when they subsequently attempt to log in via SAML2. Note: the username is not used for matching purposes.